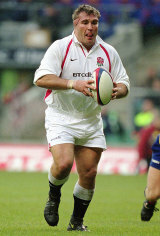 Jason Leonard was the youngest man ever to pack down in England's front row when he made his debut aged 22 against Argentina in 1990. Fourteen years later he retired as the only English player to rack up a century of Test appearances, and was for a time the world's most capped player. Leonard's career spanned the amateur and professional eras, and he was successful in both. It is a testament to his skill and commitment that he was able to adapt so easily to the changing rugby environment. As a raw 22 year old Leonard was a 16 stone, mobile prop. He adapted to the onset of professionalism and the greater physicality of scrum time by bulking up to the gargantuan figure that signed off from rugby in 2004. He was a committed servant of Harlequins during his career, making 290 career appearances for the London club after arriving from Saracens. Leonard was part of the England team that was defeated in the 1991 World Cup Final by Australia, a defeat that he has since described as the lowest point of his career. His career was thrown into doubt after only ten Test matches when a ruptured vertebra required emergency surgery following England's Grand Slam win over Wales in 1992. With bone grafted from his hip to replace the damaged area, Leonard was remarkably back in action against Canada that autumn. He was selected for his first Lions tour in 1993, and won an England record 38th cap for a prop in the 1995 Five Nations clash with Scotland. Leonard was included in the 1995 Rugby World Cup squad, and exacted some measure of revenge on the Wallabies when England progressed to the semi-final following a last-gasp victory in the quarters. As his career progressed, Leonard became adept at playing in both the loose-head and tight-head positions, an unusual skill and one that meant that he was ever-present in the England front row during the mid to late 1990s. In 1997 he was selected for the Lions tour of South Africa under Ian McGeechan and became part of a famous series victory after coming on as a replacement in the first Test. Leonard continued to dominate a place in the England front row into the new century, and was a part of the side that won Six Nations championships in 2000 and 2001 and the Grand Slam in 2003. He was selected for his third Lions tour by Graham Henry in 2001, and added two more caps as a replacement in both the first and second Tests against then-world champions Australia. This time, Leonard and the Lions were unable to secure a series win. His 100th England cap came in the 2003 Six Nations opener against France at Twickenham, and his record-breaking cap came against the same opponents later in the year, as part of Clive Woodward's 2003 World Cup squad. He came on as a replacement during the final, playing the full period of extra time and seeing Jonny Wilkinson slot the drop goal that brought the cup to England for the first time. The introduction of Leonard into the fray halted the flow of penalties that were going against England in the scrums, and undoubtedly contributed to their scraping home with a 20-17 lead. It was a feature of Leonard's career that despite spending a large proportion of his time buried beneath the opposition he was able to read the game and understand his part in his team's success. This was exemplified perfectly during the World Cup final.